We’d love your help. Let us know what’s wrong with this preview of Careful! by Steve Casner. The modern world can be a dangerous place, filled with fast cars, smart phones, drugs and extreme sports. Meanwhile, we humans are as fragile as ever. In fact, after a century of decline in injuries and accidental deaths they are on the rise again. The question is – why? 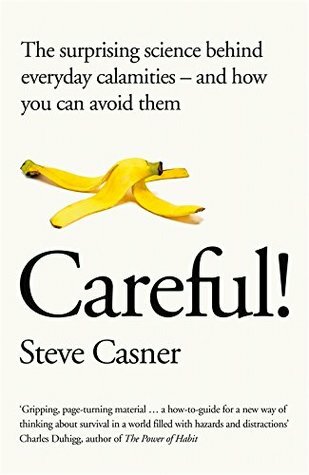 Steve Casner has devoted his career to studying the psychology of safety, and he knows that there’s not a safety warning we won't ignore, or a fool-proof device we can't turn into an implement of disaster. Based on years of research and understanding of human behavior learnt as a research psychologist, Careful! is the definitive user-guide to avoiding everyday calamity. It will help us understand why we behave in such contradictory ways – insisting on fat-free salad dressing but then texting while driving – and explain the psychological traps that can lead us to the scene of an accident. By showing us how and when injuries happen, we learn what we should really be worrying about. Helping to keep our fingers attached in the kitchen, our children afloat at the pool and teenagers safe behind the wheel, Casner shows us all the ways we can take control of our own safety and get through the day in one piece. To ask other readers questions about Careful!, please sign up. Be the first to ask a question about Careful! This was an interesting and surprisingly witty book that justified all the paranoid behaviors I already have. Lots of scary statistics but also practical ideas about how to be safer. *I won this book in a Goodreads giveaway. I knew I was in trouble when early in the book I see, "In a recent study, my colleague...found that while driving on open stretches of road, drivers spend significant amounts of their time engaged in what we call mind wandering or task-unrelated thought." Really. Statistics are simply presented, usually combined with a corollary from the aviation world, since the author reminds us he is a pilot. No cutting edge psychology here, but instead only simple advice you probably already know and a thoro I knew I was in trouble when early in the book I see, "In a recent study, my colleague...found that while driving on open stretches of road, drivers spend significant amounts of their time engaged in what we call mind wandering or task-unrelated thought." Really. Be safe, we care about you.. This book strengthened my already strong inclinations to avoid preventable injuries and to help family and friends do likewise. The style is clear and conversational. I heartily recommend it. I got a paper cut reading this book. Okay, just kidding. This is a thoroughly engaging and fascinating look at how injury prone we've become and possible reasons why. It has totally cured me of looking at my cellphone while driving, even at stop signs. The author, a psychologist and aviator, discusses lot of workplace issues. I work in a hospital, where being error-proof is a must, and have recommended Careful to all my colleagues. This book was funny, educational, and terrifying!! It should be required reading for everyone, especially those who drive. This is a great book about public and personal safety issues. Well researched and presented in an engaging, thoughtful way. 3.5 stars Mostly this book left me worried and scared of all the decisions I make in my daily life. It was an enjoyable read and I appreciating Steve self-depreciating sense of humor. Now, I'd like to think that I'll be a little more careful in my daily activities. Steve seems to think that I will most likely just return to my usual activities and land myself in the Darwin Awards. Should be studied in schools. My reading this book might have saved a woman's life yesterday. Definitely worth the read and heeding the advice. Pros: Lots of good safety tips! Cons: Needed additional copy-editing ("lime disease"); I think the book would have worked better with the stories as cutaway boxes, and photos, more of an interactive read; this book should not be read by anyone already scared of flying, because even though your chances of issues while flying are ridiculously low (as I already knew and the book states), this book still managed to have multiple examples of things that can go wrong. This book takes you through all the likely and unlikely scenarios in which being reckless or risky can seal your fate 6 feet under. With bits of humor sprinkled in, Casner tries his darndest to warn readers of the implicit dangers lurking in everyday tasks when we don’t factor in the likelihood of making mistakes. He attempts to bring our shortcomings to light and strategize for the inevitable slip-up. I found this to be an eye-opening book. Due to many perceptions, one is apt to place oneself in danger. For instance, we are unable to multi-task. We can only switch our attention. This causes us not to be fully focused on the task at hand, and we can easily get hurt. Becoming more mindful of what we are doing will help reduce the chances of accidents. Research is showing that we become less concerned with others (self-preservation) and ignore signals and advice. This makes sense from an ancient I found this to be an eye-opening book. Due to many perceptions, one is apt to place oneself in danger. For instance, we are unable to multi-task. We can only switch our attention. This causes us not to be fully focused on the task at hand, and we can easily get hurt. Becoming more mindful of what we are doing will help reduce the chances of accidents. Research is showing that we become less concerned with others (self-preservation) and ignore signals and advice. This makes sense from an ancient view, as in flight or fight. However, we are subject to so many shiny objects these days, that we start to become overwhelmed. One way that we can protect ourselves is to think ahead. Try to imagine what could go wrong with what you are doing so that you can try to prevent issues. This would also help you to focus and to bring awareness to the task. Accidents are not waiting to happen. With a little insight and preparation, most are avoidable. For the majority of last century, accidents and preventable injuries were on the decline. This was due to increased innovation, safety measures and design, as well as better regulation and improved practices such as workplace health and safety. But since 2000, these numbers have been increasing again and Steve Casner is all too aware of this through his work as a research psychologist with NASA. It is his job to make our skies a safe place and in his book, Careful! The Surprising Science behind Everyday Calamities he compiles a lot of his research and experiences with human behaviour into an accessible volume that should prevent us from becoming another calamity Jane or John Doe. 2.5 stars for Steve Casner's book. Lots of statistics about how/why humans are prone to injury presented in an entertaining manner. I can easily see this book being devoured by undergrad psychology students. For the rest of us you may pick and choose your chapters at random to learn why we don't follow advice, run red lights, use tools incorrectly, etc. Summary: everyone makes mistakes including Super-geniuses. NOBODY is good at multitasking. MOST of us are not even very good at paying attention to one thing at a time. Do not use a screwdriver for anything except driving screws. If you want to be safer, find ways NOT to use an automobile. A perfectly adequate book to make you think a little more critically about what you can do to avoid injury. You probably already know this stuff but you almost can't be reminded too often. Really interesting about human psychology but also I learned a lot about the airline industry. Boring title but unexpectedly great read 🙂! Sensible look at how we injure ourselves and how often our thinking is to blame, with sound advice on how to circumvent this weakness to lead safer lives. Humorous and fun, but a very good guide to why we do dumb things. interesting and useful but somewhat repetative. not sad i read it though.